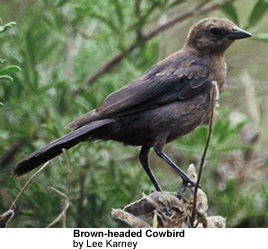 Cowbirds are found in the Americas. It is a brood parasitic species, as they place their eggs into the nest of other birds (= host nests). The only non-brood parasitic species is the em>Agelaioides [formerly Molothrus] badius. They feed on insects, including following cattle to prey on insects they stir up. Cowbirds have adapted by laying their eggs in other birds' nests as these nests are unattended. The cowbird eggs look similar to the hosts' eggs and the host will normally incubate the eggs. The cowbird chicks grow quickly, and may consume most of the food the host brings. The cowbird chick may use its large size to push the other chicks out of the nest.